(CNN) -- When the series "ER" airs its finale on Thursday, the event will not only mark the completion of one of NBC's most successful shows, but it can also be viewed as the end of an era for the network. 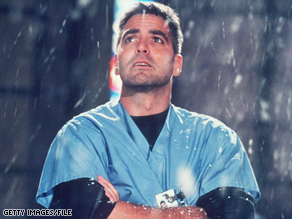 NBC's "ER," which ends on April 2, helped launch the careers of several actors, including George Clooney. "What's so symbolic about 'ER' leaving is that that 10 o'clock Thursday night slot started out what I always called the beginning of the second golden age of television with 'Hill Street Blues'," said Robert Thompson, a professor and founding director of the Bleier Center for Television and Popular Culture at Syracuse University. "In almost a quarter of a century it went from 'Hill Street Blues' Thursday at 10 to 'L.A. Law' Thursday at 10 to 'ER' Thursday at 10. 'ER' is kind of occupying sacred space." Beginning this fall, such prime time real estate, which also previously housed another acclaimed hospital drama, "St. Elsewhere." will be occupied by a new talk show helmed by "The Tonight Show" host Jay Leno. It's a significant move for NBC in an age where sitcoms and dramas have increasingly given way to the less-expensive-to-produce reality TV shows. "ER," which at one point was paying millions of dollars per episode just in actor salaries, definitely fit into the realm of costly productions. It almost never made it out of a pile of scripts. Created by the late author Michael Crichton and steered by the creative team at Steven Spielberg's Amblin Entertainment, the concept didn't immediately tickle the fancy of television honchos. "Every network had passed on it, twice," the show's longtime executive producer, John Wells, told The New York Times. "It had all these characters and medical dialogue, and they found it utterly impossible to follow." Once it did get the green light, it caught on like a house afire. "ER" quickly attracted legions of fans and catapulted many members of the ever-changing ensemble cast to superstar status -- most notably George Clooney, who played hunky Dr. Doug Ross. Baltimore Sun television critic David Zurawik, who writes about the industry in the paper's "Z on TV" blog, said there may never be another collection of such talent in an ensemble drama on network television. "There's just no way in the business model of network television for a producer out in Hollywood to say 'Here's the concept, and I've got this star, this star and this star,' " Zurawik said. "By the time they got two sentences out, the production studio head they are pitching would say 'Who's going to be paying for that.' The economics for that are just not there, and neither is the audience." Zurawik noted that audiences and actors alike now have gravitated to cable television, where dramatic hits such as "Mad Men" and "Rescue Me" are being produced by the likes of AMC and FX. "Cable is growing whereas network TV isn't," Zurawik said. "The better actors, the ones who work in film and theater, really like doing cable because cable has been flexible. It's not, if you sign on to this series you are going to do 22 episodes a year and you have to sign away five or six years of your life. Nobody wants to do that anymore." Former Dallas Morning News TV critic Ed Bark, who now runs the site Uncle Barky's Bytes, said he believes in the coming years most of the Emmy-caliber shows will be on cable. Cable television benefits, he said, from the double revenue stream of both money from advertisers and subscribers, so there is not the ratings pressure network television has. Moreover, high-quality dramas are valuable calling cards, he added. Cable stations have been successful at branding themselves based on some of the shows they are producing. "A lot of times, it takes one show to get people to look at your network as a place where you can see quality drama," Bark said. "For FX, it was 'The Shield.' For TNT it was 'The Closer.' For AMC, it was 'Mad Men.' I think once you get an audience over there, you build on that." However, at least some of cable's audience gains come at the expense of network TV's audience, which has shrunk substantially in the 15 years since "ER" went on the air. Indeed, the drama's demise is symbolic of long-term programming trends, said Thompson. The TV and pop culture professor, who has written several books on television, said NBC choosing to cede 10 o'clock to a talk show rather than another great drama speaks volumes, though he wouldn't count out the genre entirely. "This is not a good time to buy television drama futures, but I don't think they are going to die," Thompson said. "The TV drama is going to be like the American bison. There used to be herds and herds of them roaming the country. They're not dead, but there are just not as many."